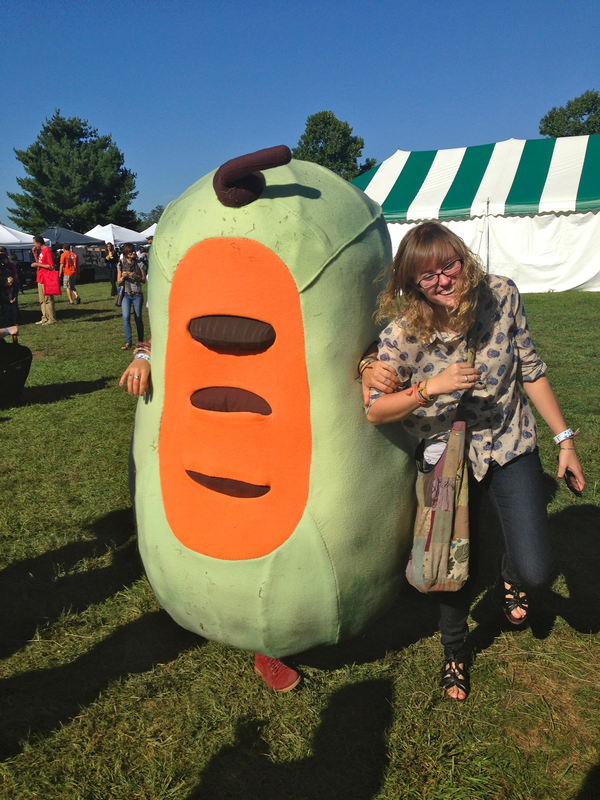 Throughout the grounds, the festival-goers are abuzz with pawpaw love. The aroma of the pawpaw cuisine causes the lively attendees to become instant pawpaw addicts. They simply cannot consume enough of the unique fruit. Pawpaw fever was in full swing as students and community members gathered for the 15th Annual Pawpaw Festival, to enjoy and discover the treasured fruit in Albany, Ohio. “I had no idea the pawpaw existed until I came to the area. I love the pawpaw festival. It is the third or fourth year I have visited,” second-year graduate student Kellee Steffen said. During the festival, tents gave out information for newcomers and free samples constantly floated around. “The unique flavor took me by surprise. It tasted similar to a mango, pineapple, banana,” junior Amanda Breedlove said. The pawpaw contains a yellow-orange inner fruit with a brownish green skin when ripened. The various pawpaw dishes shone as the highlight of the festival. Pawpaw foods available included Casa Nueva’s pawpaw brownie, Herbal Sage’s pawpaw smoothies and Mardiana’s Cuisine’s pawpaw curry puff. Casa Nueva also used the savory fruit to their advantage in their star dish, hearty chili topped with cheese and tortilla chips. The Ohio Pawpaw Festival also sells pawpaw beers brewed by Jackie O’s, Black Box Brewing Company, Thirsty Dog and others. “My definite favorite beer is Thirsty Dog. The Pawpaw Festival is something that always draws me back,” senior Becka Bolmida said. Dr. Ron Powell, a pawpaw grower and expert, explained that besides being tasty, the fruit contains nutritional value, such as antioxidants, potassium, vitamin C, calcium and protein. Since 1992, Powell has grown and experimented with the pawpaw. He even put together a cookbook and hopes to publish another. “I want to publish a cookbook with more mainstream foods combining pawpaws like pawpaw mac and cheese and pawpaw meatloaf. Pawpaws just aren’t for breads and desserts,” Powell said. Powell realized that the pawpaw remains largely unknown to the majority of the country. “I like to think of it as Ohio’s native fruit,” Powell said, who is also the current president of the North American Pawpaw Growers Association. However, the fruit is slowly gaining recognition around the world. He noted that Italy is currently researching the obscure North American fruit. Romania, South Korea, Czechoslovakia, Portugal and Brazil also are growing the fruit. As obscure as the fruit continues to be, the fruit plays a unique role in America’s history. Powell mentioned that the frozen pawpaw was George Washington’s favorite dessert as well as the fruit that Lewis and Clark amazingly survived on during the last few weeks of their expedition. This intriguingly historical pawpaw continues to play a role in today’s society as a hidden gem for all who consume the tasty fruit. Get your hands on a pawpaw if you haven’t tried one yet. What are you waiting for?